Catholic religious orders use the word 'charism' to describe their spiritual orientation and any special characteristics or values. A charism (from the Greek: χαρ?σμα) in general denotes any grace that God gifts to an individual or group to perform a specific mission in the Church and the World. The Carmelite Family believes that the heart of our way of life - whether we are friars, enclosed nuns, apostolic sisters, laity, or hermits - is contemplation. Saint John of the Cross described contemplation as the inflowing of God's grace into a human being. More recently Fr. Joseph Chalmers, O.Carm., has described it simply as 'friendship with God'. Another Carmelite has said that the Order's charism is "to know and love God, and to make God known and loved". Carmelites seek to be contemplative. We believe that God's grace and friendship is offered to all people, not as something we can earn or attain by our own efforts, but as a free gift of God, given whenever and to whoever God wishes. To become contemplative Carmelites seek to open their hearts to God, practicing what our tradition calls 'vacare Deo' (Latin for 'space for God' or 'openness to God'). Many people understand the term 'contemplative' to mean someone withdrawn from the world, perhaps living in silent retreat and practicing 'contemplative prayer'. Whilst Carmelites value silence and solitude, we understand contemplation in a broader sense. Carmelites speak of contemplation as a gift of God that can be nurtured by a life of prayer, community, and service. These three elements are at the heart of our charism. In prayer (or worship) we build up a friendship with 'the God whom we know loves us', as St. Teresa of Avila described it. In community building (or fraternity) we encounter God in our brothers and sisters, who comfort and challenge us. In service (also known as mission, apostolate, or ministry) we open ourselves to be God's hands in the world, responding to the needs of others, especially the poor and marginalised. Carmelites believe that it is the combination of these three elements - prayer, community and service - that makes us better disposed to receive God's gift of contemplation. Placing too much or too little emphasis on one particular element is not helpful. If we are to speak of 'contemplative prayer', then we should also speak of 'contemplative service' and 'contemplative community'. As an idea 'contemplation' is both complex and radically simple. It is a mysterious gift of God, and different Christian traditions and religious orders have slightly different understandings of it. At different times in the Carmelite Order's history our charism has been articulated in slightly different ways, or with varying emphases. The most recent statement about the charism of Carmel was in the 1995 Constitutions of the Order, in which Chapter 2 is entirely devoted to the idea of charism. The Carmelite Order is currently engaged in an academic project to see how our charism has been understood in different eras of history. It used to be common to speak of religious orders as 'active' or 'contemplative', but Carmel understands contemplation and action to be complimentary, not contradictory. Our prayer, community building and service inform one another, and together are part of our contemplative vocation. We might be better referring to 'active' and 'meditative', but again the two are linked. It was sometimes said that the Carmelite friars were 'active' and the Carmelite nuns were 'contemplative', but both vocations are contemplative, and that means being both active and meditative. 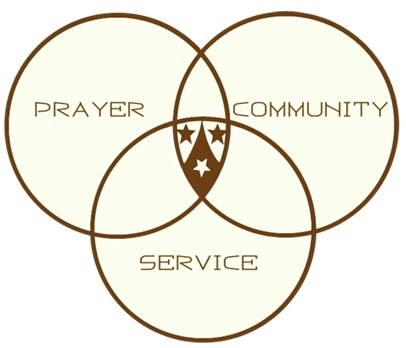 The elements of prayer, community and service are not unique to Carmel. Every religious order, every Christian, and indeed every person of any faith is called to practice and combine these elements. To become a contemplative - some might say "mystic" - is not something strange; it is what all Christians are called to by the grace of baptism. As Jesuit theologian Karl Rahner once said, "The Christian of the future will be a mystic or will not exist at all." The mistake would be to think of mystics as esoteric people who live on a cloud or a pillar; mystics, contemplatives, are people with their feet firmly rooted on the ground in the reality of ordinary life, and open to God's extraordinary love. So what is distinctive in Carmel? So if all Christians are called to be contemplative, what makes the Carmelite way of life distinctive? There are many good and holy ways of living that are not Carmelite. But for those called to live out the Carmelite vocation, what is distinctive is the way that we practice the elements of prayer, community and service, taking particular inspiration from the prophet Elijah, and the Blessed Virgin Mary, patrons of our Order. Elijah and Mary pondered God's Word in prayer, related to others in their local communities, and served those in need. These patrons of the Order have inspired Carmelites over the centuries, and the Order today takes inspiration from other saints - holy men and women - who have lived the charism. Doctors of the Church such as John of the Cross, Teresa of Avila and Thérèse of Lisieux have contributed to our understanding of Carmel, as have many other holy men and women, canonised or not. Our brothers and sisters in the Discalced Carmelite Order take particular inspiration for their charism from Saints Teresa of Avila and John of the Cross, whom they regard as founders of their particular branch of the Carmelite Family. Our charism is also informed by our Rule of Saint Albert, given to the first Carmelites on Mount Carmel around the year 1200 as a sort of 'vision statement' of how they should live together. The Rule encourages Carmelites to place particular emphasis upon Scripture, God's Word in the Bible. Again, this is not unique to Carmelites, but is a distinctive aspect of our life. The Rule unites all the different branches of the Carmelite Family; its spirit is expounded in the Constitutions or Statutes governing each particular group within the Family. For some religious orders, their charism inspires work in a particular area. For example, some orders are devoted to teaching, or caring for the sick, or spreading the Gospel as missionaries abroad. Carmelites are not restricted to one particular ministry or apostolate. We go where we are needed, and where our gifts can best be put to the service of God and neighbour. Each person who joins the Carmelite Family brings unique gifts that we seek to match to a particular form of outreach. Rather than doing a particular form of ministry, we seek through a variety of ministries to know and love God better, and to make God better known and loved. Just as Carmelites are not restricted to one particular apostolate, so we are not restricted to one particular form of prayer. Our Rule encourages us to ponder Christ and the Scriptures, particularly in the Liturgy (Mass and Divine Office), and to spend some time in silent meditation. Other than that, Carmelites are free to practice whatever forms of prayer they find helpful in nurturing their friendship with God. Carmelite prayer is more an attitude or understanding, rather than a particular method. Rather than being restricted to one particular form of prayer, we seek through a variety of forms of prayer to know and love God better, and to make God better known and loved. There is also a great degree of flexibility in the Carmelite charism when it comes to forming community. Communities of friars (brothers) may vary in size and style depending on the members of the community and the place that it serves. Carmelite nuns live a more 'intense' community life that is enclosed, whereas Carmelite apostolic sisters are 'out and about' and are closer to most friars in their style of community life. Lay Carmelites occasionally live together in community, but in most instances they live in their own homes and form community when they come together for meetings perhaps once or twice a month. In all these different ways of living the Carmelite charism, emphasis is placed on the value of solitaries coming together to form community. The precise form that community takes can vary considerably from place to place, and country to country. Rather than being restricted to one particular form of community, we seek in many different forms of community to know and love God better, and to make God better known and loved. Carmel is distinctive in the variety of forms in which it is found, and the diverse elements it encompasses. The Carmelite way of life began with a group of consecrated lay men living as hermits on Mount Carmel. They were perhaps former crusaders and pilgrims who adopted a penitent lifestyle in the desert tradition. These hermits lived in community, and therefore had elements of the cenobitic or monastic life. The origins of Carmel are therefore eremitic and cenobitic. When the Carmelites came to Europe, the hermits quickly developed into an order of mendicant friars (begging brothers). Friars are known for their promotion of spirituality across all sections of society, and their pastoral concerns. Carmel's spirituality therefore became mendicant. When nuns developed in the Order, the monastic elements of Carmel came to the fore. With the growth of the Third Order (Lay Carmel), the secular spirituality of Carmel in the world was recovered. Carmel is therefore an interplay, a balance of tensions between these different forms of life: eremitic, mendicant, monastic, lay. The reforms of Carmel over the centuries have often been attempts to rebalance the creative tensions between these forms of life, or to draw out more strongly one particular element. The 1995 Constitutions of the Carmelite Order - Chapter 2 (paragraphs 14-28) are devoted to the charism of the Order. The Carmelite Charism and the Third Order in Britain - a talk given in 2009 by Fr. Miceál O’Neill, O.Carm.